This week I didn’t get to write anything new, which means it’s been a crazy week. Instead, I edited A Sense of Obligation. I’ve mentioned before that I expanded Jane and Bingley scenes and here’s a snippet from one of my favorite additions! In the carriage on the way to his solicitor’s office, he shook his head. Caroline had not taken the news of his engagement to Jane well. She took the news of Darcy’s engagement to Elizabeth even worse. When Miss Lucas’ betrothal was announced at the ball, Caroline’s mouth fell open. He found Charlotte Lucas very pleasant company, but women like his sister only saw that she was plain, nearly on the shelf, and had no fortune and no style. Caroline had not kept her complaints to herself in the days between the ball and Darcy’s wedding. “What can possibly recommend her to him?” she asked over breakfast while Darcy was out riding the morning after the ball. “I daresay he loves her,” Louisa replied. He and Louisa shared a look and simply shook their heads. Caroline scoffed and rose to pour another cup of tea. “You ought to have done better than Jane, too,” she said. She furiously stirred the tea, and the spoon clanging on the side of her teacup grated his nerves nearly as much as her words. “That is enough! I will not allow you to malign another person’s name at my table.” It had felt good to take a firm stand. 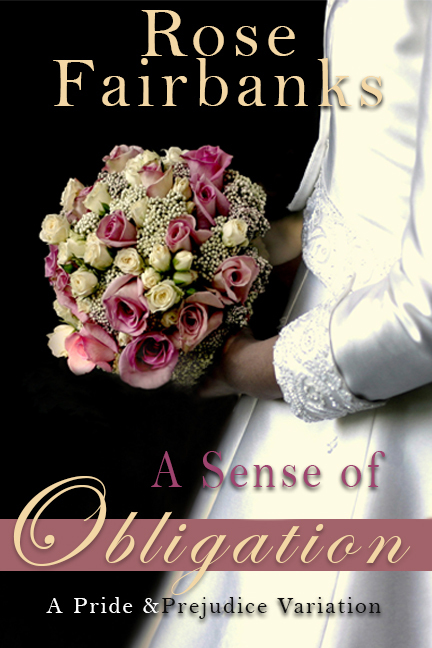 A Sense of Obligation is available now for preorder on Amazon and will be releasing there, Nook, Barnes&Noble, Kobo, ibooks, GooglePlay and Scribd (I hope) on July 25th. Go Bingley! Wonderful excerpt, Rose. Here is a small snippet of my friend Rose Fairbanks’ book, A Sense of Obligation. It is set to be published later this month and is available for preorder right now. This excerpt is a fun one as Bingley finally calls Caroline on her behaviour.